A fun twist on a classic favorite! Preheat your oven to 375ºF. Line a baking sheet with foil and set aside. Place a saute pan over medium-low heat and add olive oil. Add the onions and garlic with a pinch of salt, and cook until the onions begin to soften, about 2-3 minutes. Stir in the cumin, coriander, paprika, cinnamon and cayenne and toast for a minute. Add the tomato paste and ginger, cooking for 1 minute more. Remove from the heat to cool slightly. In the meantime in a large mixing bowl, combine the breadcrumbs, almond milk, egg, cilantro, parsley, mint. Stir in the onion mixture, ground turkey, and season with salt and pepper. Remove mixture to the prepared baking sheet and shape into a loaf. Bake until golden brown and cooked through, about 30-45 minutes. Remove, allow to cool slightly, slice & serve. Tip: Make it your own! 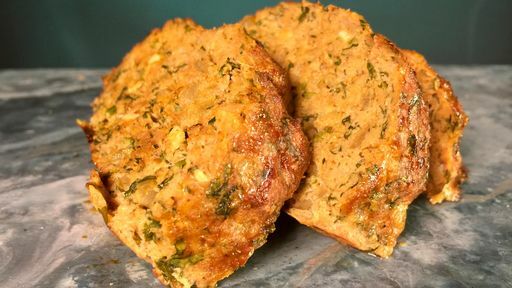 Substitute your favorite spice combination to give this meatloaf your own personal flair!